The Elysees 8 Hotel is a 3 stars hotel with 34 rooms, enjoying a prime location in the heart of Paris and the beautiful Madeleine district. Only 10 minutes from the Champs-Elysees and 5 minutes from the Department stores (Printemps & Galeries Lafayette), this 3 stars hotel offers modern rooms with free WiFi internet access, a delicious buffet breakfast and a 24-hour reception. Ideally located between the Champs-Elysees and the Opera Garnier, it is easy to explore Paris and visit all the most famous sights of the capital of France. The Elysees 8 Hotel offers 34 modern rooms with free WiFi internet access, flat screen TV, telephone and private bathroom with hairdryer. - Privilege room: For 1 or 2 persons, one Queen or King size bed (or 2 single beds), and private bathroom. Two rooms with shower, adapted for disabled person and wheelchair. - Executive room: For 1 to 3 persons, one Queen size bed and sofa, with private, spacious bathroom with bathtub. - Junior Suite Eiffel: Located on the top floor, overlooking the Eiffel Tower. For 1 to 4 persons, with one King size bed (or 2 single) and sofa bed, private bathroom with shower, and separated WC. Children under 2 years old: baby cot at no extra charge, must be specified at the time of booking. - The public car park 'Vinci - Malesherbes Anjou' is just 250 meters from the hotel - about 35 EUR / 24 hours. Reservation is not possible, but the parking offers a very large capacity. 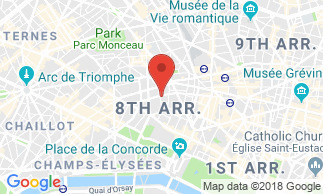 Close to the beautiful squares 'Place de la Madeleine' and 'Place Saint-Augustin', in the heart of the 8th arrondissement of Paris, the Hotel Elysées 8 invites you to discover the capital. Take advantage of this privileged location, close to the main attraction of the city, and enjoy the numerous public transports near the hotel. The hotel is located halfway between the 'Miromesnil' station (lines 9 and 13) and the 'Saint-Augustin' station (lines 9 and 14), and just a 5-minutes walk from Madeleine station (lines 8, 12 and 14) and the Saint-Lazare railway and metro station (RER E, suburban trains). The Hotel Elysées 8 offers a delicious buffet breakfast for a great start to the day. The breakfast is served every day in the dining room from 6:30 am to 10.30 am. Price of the breafakst : 13 EUR per person. (BNB rate: breakfast included).